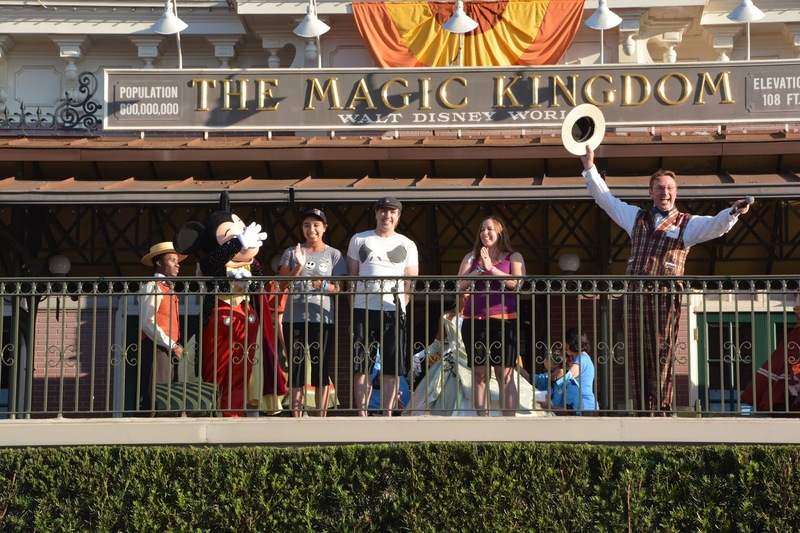 Have you ever been to rope drop at Magic Kingdom? If you have, you know all about the Welcome Show that precedes park opening. It’s filled with characters and costumes, dancers and Main Street U.S.A. familiar faces. 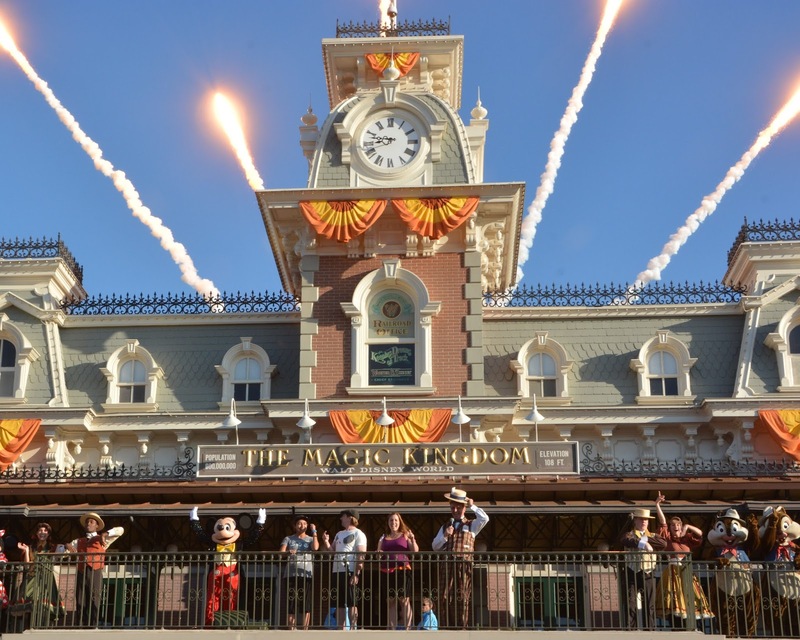 Each morning before the show begins, one lucky family is chosen as First Family at Magic Kingdom to help open the park. I’ve dreamed about what it would be like to be the First Family and stand on the train station platform, counting down from ten until the fireworks soar through the air and the thousands of early risers begin heading through the tunnels for breakfast or to hop on their favorite ride. The Kid and I have chatted about what we would do if we were ever chosen and how I would attempt to maintain my composure. Last week, my family was chosen. I get goose bumps just thinking about it. 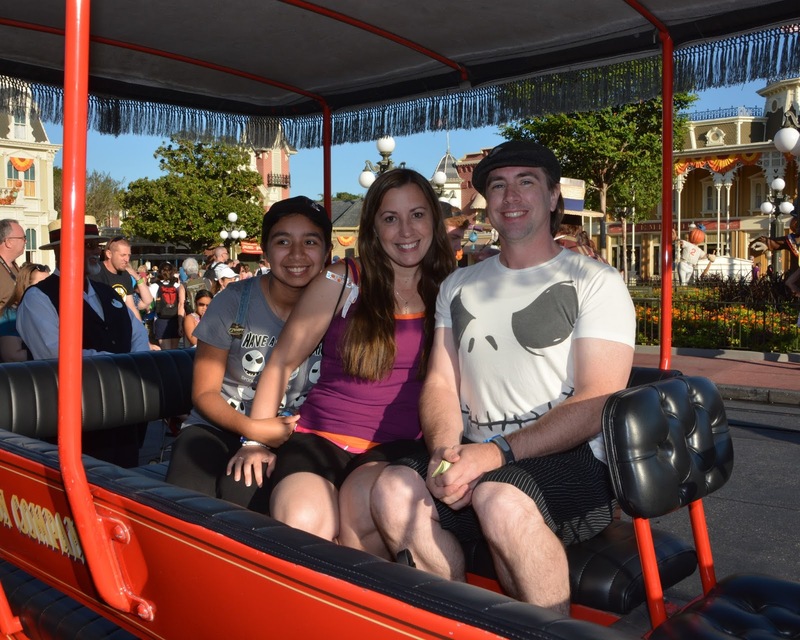 Want the scoop on what it’s like to be Magic Kingdom’s First Family and what will up your family’s chances? I’m happy to share my family’s perfect day and dream come true. All I need to do is whisper “Disney” into The Kid’s ear and her eyes pop open. When we’re heading to the Walt Disney World parks, she can be up and ready in 15 minutes without complaint. So, since we’re always up early compliments of sheer love for the parks, we tend to hit the park entrance a good hour before rope drop. After going through the baggage check, we’re generally there with only a few dozen families that enjoy rising early. To pass time until the Welcome Show begins, my daughter loves to dance to the happy Disney music that’s pumped through the speakers at Magic Kingdom’s entrance. A few minutes into our big number and surrounded by Halloween decorations, three cast members walked over to us and we were more than happy to chat with them. I’ve never met a stranger and The Kid loves talking to them as one day she wants to walk in their shoes. After a few minutes of very pleasant conversation, the lead cast member (the other two were “earning their ears”) asked if we’d like a little extra Disney magic in our morning. Knowing never to say no to a question like that, we began to follow him toward the center of the waiting area. That’s when he hit us: Disney picks a family each morning at rope drop to help open the park and would we like to be the one for that morning. All of those conversations about becoming First Family hit me and I couldn’t help but tear up. 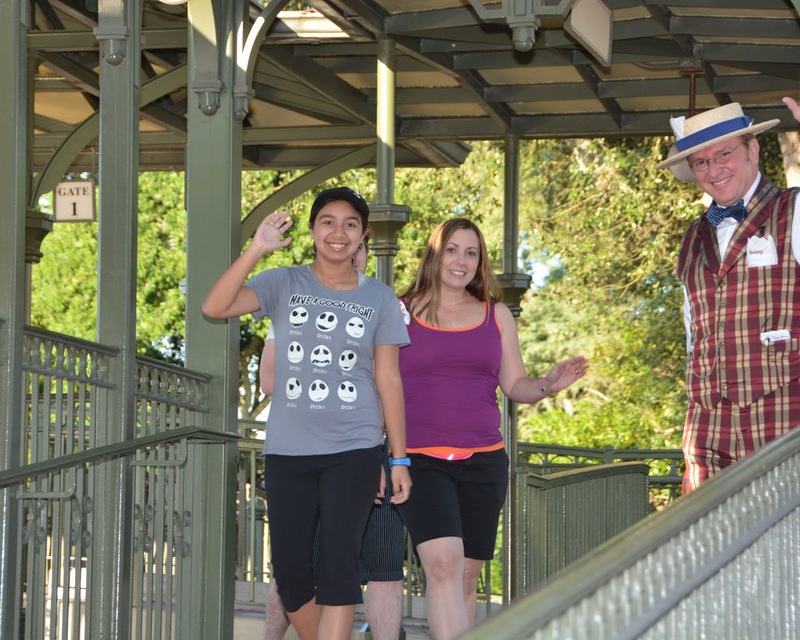 We sat on a bench for a few minutes waiting for another cast member to come for us and lead us to the train platform (where the photo above was taken) and I regained my composure. My first stop? Near the platform! I wanted to see exactly what it looked like- a view I’d been dreaming about. We chatted with the dancers about the costumes (did you know they have four- one for each season?) and I took a few photos. We watched the dancers and actually danced right along with them (behind the scenes, of course) and we were lead by Mickey Mouse to start the countdown. Scoop announced “The Locke Family from Ohio” and we made our way across the tracks. What a gorgeous view! I had to remember to take a quick photo of the view because I knew I’d never remember it. And in ten seconds, there were fireworks. We had our own personal ride down Main Street U.S.A. in an awesome Disney transportation vehicle and a Memory Maker Photographer captured our dream come true. Arrive at Magic Kingdom early. They choose First Family way before the park opens so getting there early will give you a head start. Do you have to be the very first family at the turnstiles? We weren’t. You have to love being there. The Kid and I were dancing and Mr. Locke was taking pics of us- definitely showing off our love of the park. Chat with the cast members. You never know who will be picking First Family. Make sure you don’t have an early Advanced Dining Reservation. If you’ll have to skip breakfast to become First Family they’ll definitely pass. We were asked if we had one. A day in the life of a dream come true, indeed. If it’s your family’s dream- good luck to you! THATS AMAZING!!! MADE ME CRY SO MUCH WHILE READING! THANK YOU SO MUCH FOR SHARING! I DO DREAM ABOUT BEING FIRST FAMILY AT MAGIC KINGDOM. THANKS FOR THE TIPS! Thanks, Sarah! It was a perfect moment in our Disney-loving lives and I couldn’t resist sharing! Good luck to you and your dream- and please feel free to snoop around the site as often as you’d like! So I’m just wondering but if the park technically opens at 9am meaning they have breakfast reservations at 8:05am does that mean the First Family is picked well before 8:00am or do you just mean that the first family shall be picked well before 9am because it opens for the breakfast guests an hour or more before the park actually opens? I realize this is an old post… but I will add this. My partner and I are frequently picked for special experiences in Disneyland and I think it has a lot to do with the fact we NEVER wear “tourist attire”. No shorts, sneakers or t-shirts; and I carry a cross body bag instead of a backpack.. We usually color-coordinate and I always wear dresses and brightly colored accessories (a vintage hat or fascinator never hurts)! Think what would Walt wear 🙂 Good luck! This is great info, Lizzie! Thank you so much for sharing your tips – and please feel free to creep around the site.